April 25, 2013 Nefer Khepri, Ph. D.
Soul Portrait: Second Stage ~ Ink. As I promised in my previous post a few days ago, I have been working on this Soul Portrait and have finally inked in all the pencil lines. 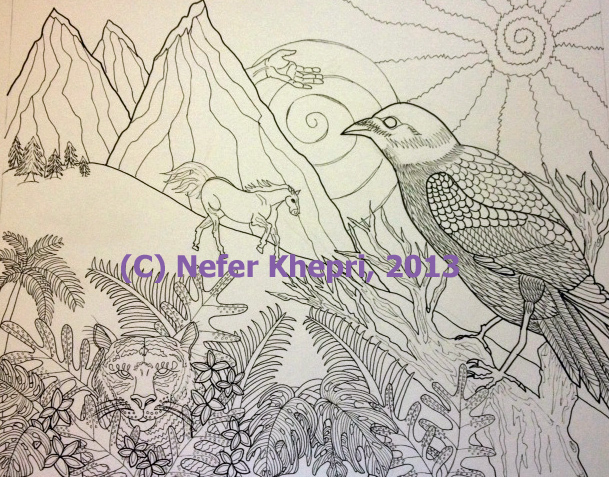 The detail on the leaves and raven required the most time. They also caused me some serious eye strain, but I’m happy with how it’s all turned out so far. Soul Portrait for L, inked. (C) Nefer Khepri, 2013. Soul Portrait that we always associate with particular colors are not necessarily meant to be those colors in a Soul Portrait. Remember, not only do the symbols carry meaning, but so do colors used. Colors combine with symbols and add energy to that symbol’s meaning. In the case of this Soul Portrait a few colors did come through so I can start adding color. However, I have to go into another meditation in order to be shown what the other colors are meant to be. The horse, for example, is it brown, black, white, a pinto? I have no idea. It may even be bright red for all I know. My guides will tell me and then I will add color accordingly. I use watercolor pencils, colored pencils, oil pastels, soft pastels & Caran D’Ache water soluable crayons for the coloring process. This part of the Soul Portrait will take approximately 2 weeks. Once the image is complete I will then go into a final meditation during which my guides will give me the meanings or interpretations of each symbol and color within the Soul Portrait. Receiving a Soul Portrait is like having your own personal tarot card created just for you. To order, please visit http://www.magickal-musings.com/soul_portraits.htm. Next Happy World Lenormand Day! & other Lenormand-related BIG news! !